Above: An X Grid UnLtd +2 with a dyed Full Spectra Kangaroo Pocket and giant hip-pack top lid. 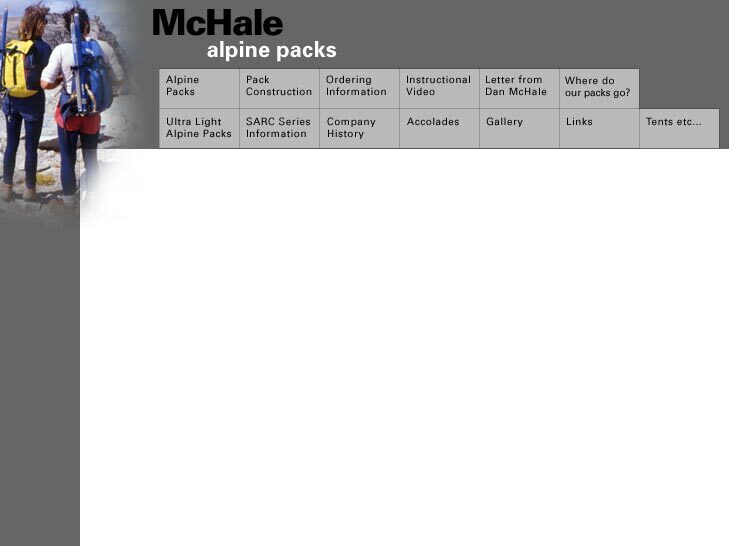 This is the lid size for the large Critical Mass packs. Below: Alternative Kangaroo - The Expedtion Utility pocket. 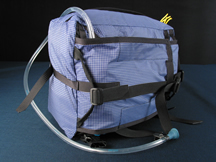 Bungy is cord lock adjustable at all 4 corners. Click to enlarge. Pocket in this photo is easily holding an Integral Designs Primaloft jacket, a Lowe W/B parka, and a Merino Icebreaker pullover! 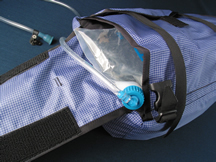 Bungy adjustments are inside the pouch and pass through grommetted drain type holes. 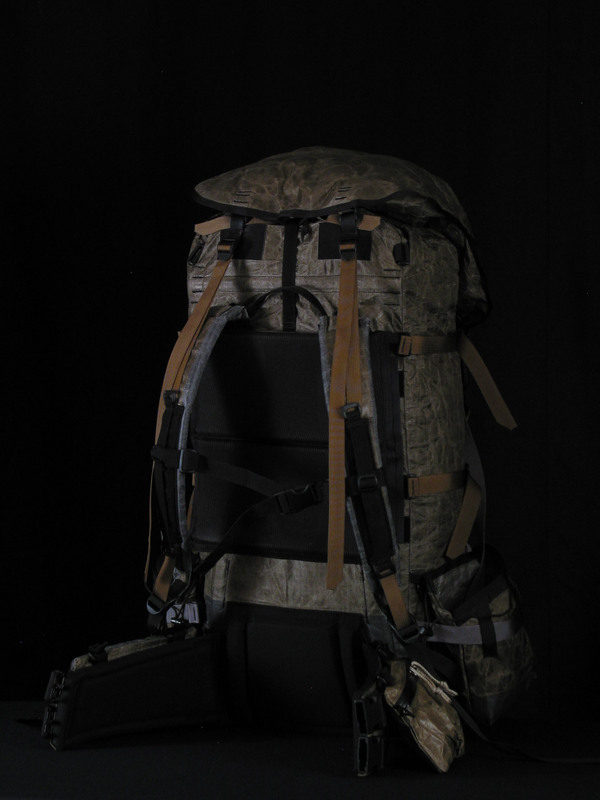 Shoulder straps for summit sack models will attach in the same way. 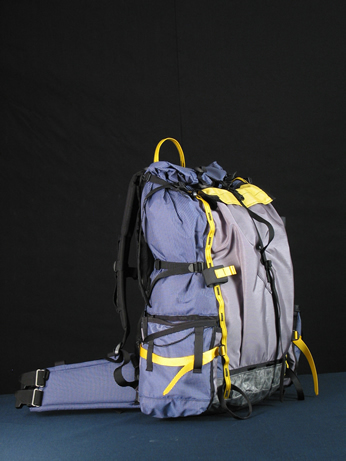 And a version with a top flap and 3 compression straps on each side: Click for larger image. 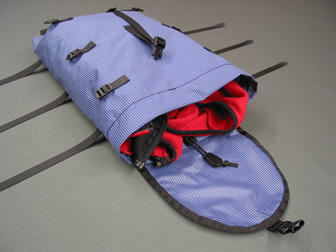 Below: The zippered version of the pouch converted to a daypack. 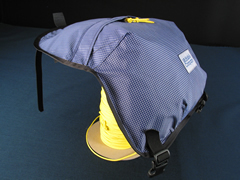 Any type of webbing, rope, or cord can be run through the corner grommet holes to create shoulder straps. 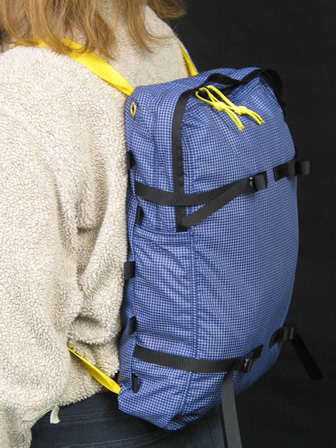 Used in conjunction with the hip pack top, you could almost going backpacking! The combination probably is not enough for Denali though. Click for blowup. Below: Removing the P&G extension Bayonets, toppocket, and back vent eliminate weight for summit pushes. Water/wand pocket can be left behind also. Pack is in roll-top mode. Below: Full Spectra Shoulder Pads - have a very supple non-abrasive feel against bare skin, adjust on clothing without dragging, accentuate the Bypass system, and are rodent proof. Click photos for larger images. An UnLtd in 100% Full Spectra below. 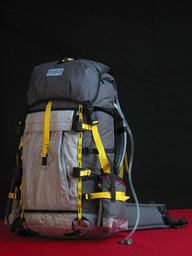 This is our most versatile expedition pack. 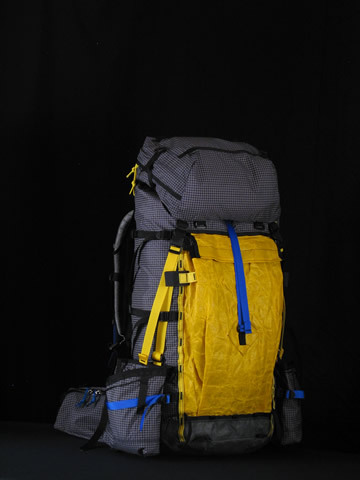 Capable of 60-70 lb loads (see CM series for 60-70 lbs and up) and over 7,000 cu in, it also converts to a day-climbing pack that performs so well you would not know it's really a big pack. Below: An UnLTD+2 for a very short person. 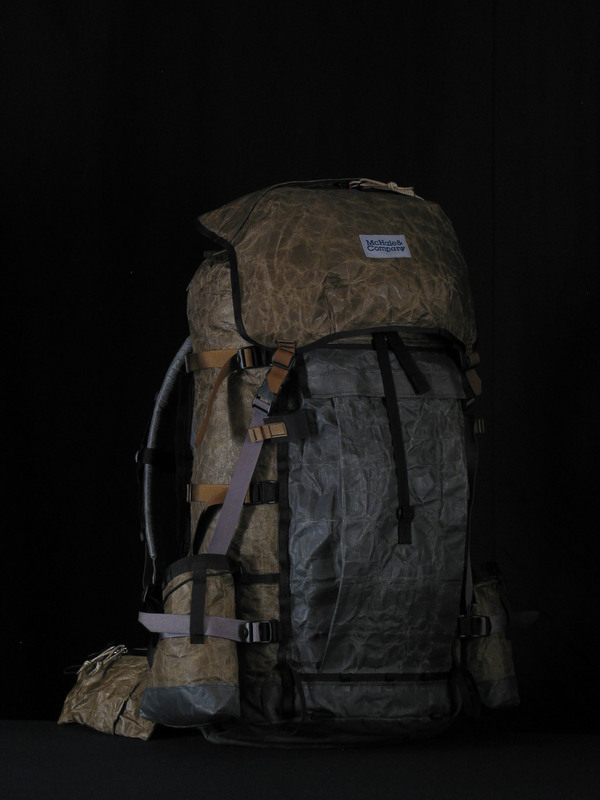 Pack shown at right weighs 5 lbs 2 oz. complete. 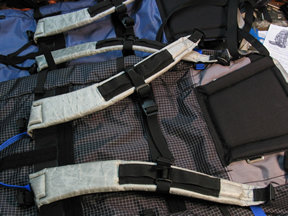 Without the extra oversize Kangaroo Pocket or the oversize water/wand pockets, it would easily go under 5 lbs. The Kangaroo is 2" taller and 1" bigger around than normal. 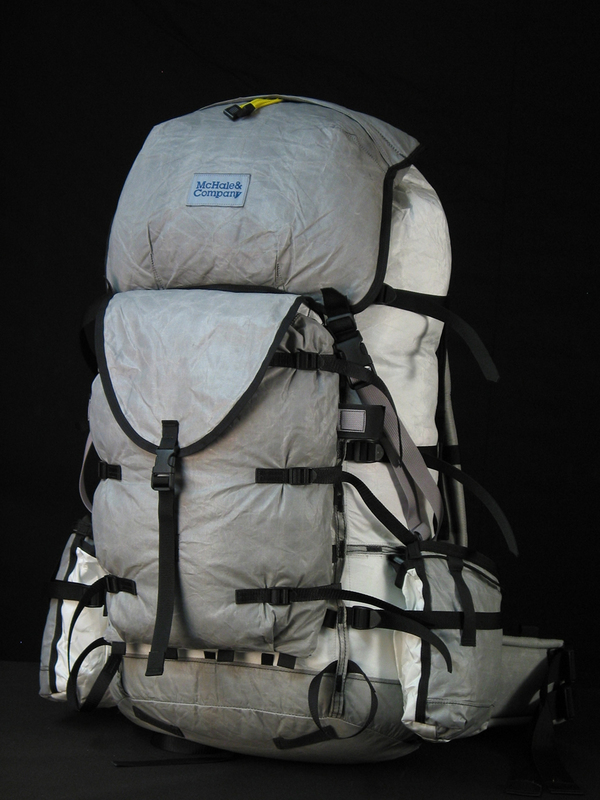 Trade the 12 oz hip pack top for a 4 oz. 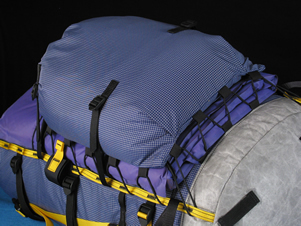 2 layer Summit Flap and we're well down into the 4.5 lb range. Below: A Super S-Sarc. Pack shown has dyed Full Spectra bottom and side reinforcing rim included in price. Below: A sporty 2 Layer Summit Flap with zipper can be swapped for a basic Hip-pack top for no extra charges. can mount on the side of the pack, or hang inside.